Niccolo Machiavelli (1469-1527), was an Italian diplomat, politician, philosopher, humanist, and best known for writing his masterpiece The Prince, a handbook for unscrupulous politicians that inspired the term "Machiavellian". He was the founder of modern political science, and more specifically political ethics. He also wrote comedies, carnival songs, and poetry. His personal correspondence is renowned in the Italian language. He was Secretary to the Second Chancery of the Republic of Florence from 1498 to 1512, after the Medici were out of power. The truth is that little is known for certain about Machiavelli's early life, compared with other important figures of the Italian Renaissance. 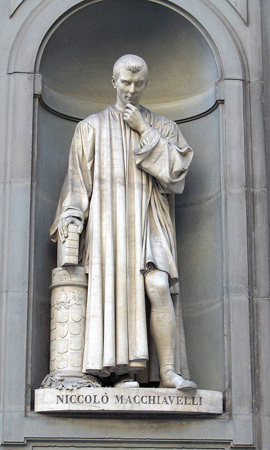 Machiavelli was born in Florence, Italy, on May 3, 1469, and was the third child and first son of attorney Bernardo di Niccolò Machiavelli and Bartolomea di Stefano Nellia. The Machiavelli family is believed to have descended from the old marquesses of Tuscany, which produced thirteen Florentine Gonfalonieres1 of Justice. Machiavelli was born during a tumultuous era -- when Italy was divided into four rival city-states, and was at the mercy of stronger governments throughout Europe. At a young age, Machiavelli became a pupil of a renowned Latin teacher, Paolo da Ronciglione, from whom he learned grammar, rhetoric, and Latin. It is thought that he did not learn Greek, even though, at that time, Florence was one of the centers of Greek scholarship in Europe. In 1494, Florence restored the republic -- expelling the Medici family, who had ruled Florence for some 60years. Shortly after the execution of Savonarola, Machiavelli was appointed second chancery, a medieval writing office, which made him in charge of the production of official Florentine government documents. Shortly thereafter, he was also made Secretary of the Dieci di Libertà e Pace. In the first decade of the 16thcentury, he carried out several diplomatic missions -- most notably to the Papacy in Rome, in the Italian states. In 1502-1503, he witnessed the brutal reality of the state-building methods of Cesare Borgia (1475-1507)and his father, Pope Alexander VI, who were then engaged in the process of trying to bring a large part of central Italy under their possession. Other excursions to the court of Louis XII and the Spanish court influenced his writings, which appear in The Prince and several other non-fiction works. staffed his army with citizens, a policy which proved to be successful many times over. Under his command, Florentine citizen-soldiers defeated Pisa in 1509. That being said, Machiavelli's success did not last. In August 1512, the Medici, helped by Pope Julius II, used Spanish troops to defeat the Florentines at Prato; although, many historians argued that this was due to Piero Soderini's unwillingness to compromise with the Medici who were holding Prato under siege. In the wake of the siege, Piero Soderini resigned as Florentine head of state and left. Hence, the Florentine city-state and republic was dissolved. Machiavelli was deprived of his office in 1512 by the Medici. In 1513, the Medici accused him of conspiracy against the Medici family and had him imprisoned. Despite having been subjected to torture with rope -- where the prisoner is hanged from his bound wrists, from the back, forcing the arms to bear the body's weight, thus dislocating the shoulders -- he denied involvement, and was released after three weeks. Machiavelli then retired to his estate at Sant'Andrea in Percussina (near San Casciano in Val di Pesa) and devoted himself to studying and writing the political treatises that earned him a place in the development of political philosophy and political conduct. His forced retirement led him to other literary activities. He wrote verse, plays, and short prose, penned The Art of War (published in 1521), and produced biographical and historical sketches. Most importantly, he composed his other major contribution to political thought -- Discourses on the Ten Books of Titus Livy -- an exposition of the principles of republican rule masquerading as a commentary on the work of the famous historian of the Roman Republic. 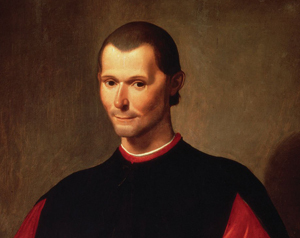 Close to the end of his life, and probably as a result of the aid of well-connected friends, whom he never stopped badgering for intervention, Machiavelli began to return to favor with the Medici family. In 1520, he was commissioned by Cardinal Giulio deMedici to compose the History of Florence, an assignment completed in 1525 and presented to the Cardinal, who had since ascended to the papal throne as Clement VII, in Rome. He died in the city on June 21, 1527. His tomb is in the church of Santa Croce in Florence, from which, ironically, he had been banned from entering during the last years of his life. Today, Machiavelli is regarded as the father of modern political theory. are accustomed, whereas a new prince has a more difficult task of ruling. He must first stabilize his new found power in order to build an enduring political structure. The work has been regarded as a handbook for politicians on the use of ruthless, self-serving cunningness -- which inspired the term "Machiavellian". While many believe that the book's title character -- the prince -- was based on the infamous Cesare Borgia, some scholars consider it a satire. Pope Clement VIII condemned The Prince for its endorsement of rule by deceit and fear. One excerpt from the book reads: "Since love and fear can hardly exist together, if we must choose between them, it is far safer to be feared than loved. 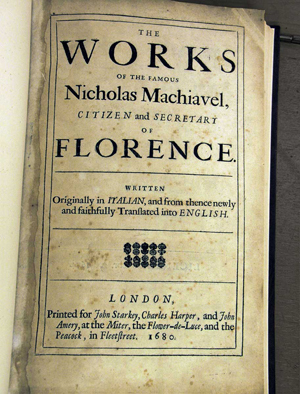 "In addition to The Prince, Machiavelli wrote the treatise On the Art of War (1521), among others, and several poems and plays, including the satirical Mandrake (1524). Meanwhile, Discourses on the First Ten Books of Titus Livy, often referred to as Discourses or Discorsi, is nominally a discussion regarding the classical history of early Ancient Rome, though it strays far from this subject matter and also uses contemporary political examples to illustrate points. Machiavelli presents it as a series of lessons on how a republic should be started and structured. It is a larger work than The Prince, and it more openly explains the advantages of republics, while containing similar themes. Machiavelli's ideas had a profound impact on political leaders throughout the modern west, helped by the new technology of the printing press. During the first generations after Machiavelli, his main influence was in non-republican governments. The Prince was spoken of highly by Thomas Cromwell in England and had influenced Henry VIII in his turn toward Protestantism, and in his tactics, for example, during the Pilgrimage of Grace. Additionally, the importance of Machiavelli's influence is notable in many important figures such as Bodin,Francis Bacon, Algernon Sidney, Harrington, John Milton, Spinoza, Rousseau, Hume, Edward Gibbon, and Adam Smith. Although he was not always mentioned by name as an inspiration, due to his controversy, he is also thought to have been an influence on other major philosophers, such as Montaigne, Descartes, Hobbes, Locke and Montesquieu. Scholars have argued that Machiavelli was a major indirect and direct influence on the political thinking of the Founding Fathers of the US. Benjamin Franklin, James Madison and Thomas Jefferson followed Machiavelli's republicanism when they opposed what they saw as the emerging aristocracy that they feared Alexander Hamilton was creating with the Federalist Party. Also, the 20th-century Italian Communist Antonio Gramsci drew great inspiration from Machiavelli's writings on ethics, morals, and how they relate to the State and revolution in his writings on Passive Revolution, and how a society can be manipulated by controlling popular notions of morality. 1 The Gonfaloniere was a highly prestigious communal post in medieval and Renaissance Italy, notably in Florence and the Papal States.